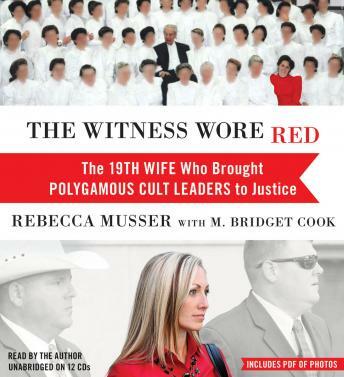 Rebecca Musser grew up in fear, concealing her family's polygamous lifestyle from the "dangerous" outside world. Covered head-to-toe in strict, modest clothing, she received a rigorous education at Alta Academy, the Fundamentalist Church of Jesus Christ of Latter Day Saints' school headed by Warren Jeffs. Always seeking to be an obedient Priesthood girl, in her teens she became the nineteenth wife of her people's prophet: 85-year-old Rulon Jeffs, Warren's father. Finally sickened by the abuse she suffered and saw around her, she pulled off a daring escape and sought to build a new life and family. The church, however, had a way of pulling her back in-and by 2007, Rebecca had no choice but to take the witness stand against the new prophet of the FLDS in order to protect her little sisters and other young girls from being forced to marry at shockingly young ages. The following year, Rebecca and the rest of the world watched as a team of Texas Rangers raided the Yearning for Zion Ranch, a stronghold of the FLDS. Rebecca's subsequent testimony would reveal the horrific secrets taking place behind closed doors of the temple, sending their leaders to prison for years, and Warren Jeffs for life. This was a very eye opening account of what really went on under Warren Jeff's leadership in the FLDS cult religion. It was heartbreaking on so many levels. I loved, loved, loved this book! I have always been intrigued by the mysterious FLDS. I really think that this religion is harmful to families, and women. It started a bit slow for me. For some reason it didn't get my interest for a while. It took some time to get used to the narrator, her voice is very soft and slow and you can tell she's reading. I started to become very interested however after the escape. I couldn't stop listening then! All in all, very informative and I can say I have a great deal of respect for Rebecca and what she went through, not only during her time with this cult but when it came time to bring them to justice. Brave lady!